If I had to list my favourite computer companies of all time, I’d have to say Microsoft for software and HP for hardware. If you ever needed any further proof of that, just look back through the history of this very blog; it’s absolutely littered with examples. The reason for my love of these companies is similar to my love of all things Ferrari; they both have a long successful history, passion, and littered with commitment to being the very best. HP is the one I want to write about today. Reading back over the history of Hewlett Packard from the days of Bill and Dave’s start up in their Palo Alto garage in the 1940’s from their humble beginnings in oscilloscopes, their rumoured involvements with Disney and the first portable calculator. The foray into the many personal computers, printers, servers, storage and strive for excellence has turned HP into what it is today; the worlds number 1 computer manufacturer. Even Apple’s Steve Wozniak designed the first ‘Apple 1’ computer whilst working for HP! More recently I’ve been captured by their purchase of another legendary company within the handheld computing market; Palm. When Palm announced their rebirth and new product at CES 2009 with the “Palm Pre” and the hype was started to take on Apple in the mobile market space, I knew I had to have one. Let me set one thing clear right now, webOS is a fantastic operating system, even though it doesn’t have majority market share; it’s slick, clever, clean and in my opinion the best looking mobile phone operating system on the market today (iOS doesn’t do it for me, Android is too cluttered, Windows Mobile 7’s tiles look too simple as blocks of colour). The original Pre was let down by a bad keyboard; which I’ve never had a problem with, until very recently which makes me think I’ve just been lucky enough to have one that’s been well built and a quality issue was more to blame than ‘bad hardware’. When Palm failed to match the hype and the company spiralled and put up for sale, I thought it would be the end of a great company. Not so, the purchase of Palm by HP was the perfect fit in every respect. Not only would HP be able to address the hardware problem, but they’d be able to revitalise webOS and push it beyond only a smart phone. Thus in turn, the recent “Think Beyond” event set the stall for what HP and Palm can achieve together with webOS. Three new products announced and a rallying call for developers to adopt the platform. First the HP Veer, a credit card sized phone running a full version of webOS for those who wish to carry a device and have more room in the pocket, the Palm Pre 3, the first HP built Pre hardware running the latest webOS 2.1 software and finally the HP Touchpad, the first webOS tablet device designed to go head-to-head with Apple’s iPad. Just by looking at the photos of the Pre 3, it visually looks like a much more solid and better designed device than the original Pre (I’ve never seen a Pre 2, so I’m unsure just how much of a shift there is in build quality between version 2 and 3). I’m under no illusions that this improvement in hardware quality has HP’s signature all over it; the keyboard looks a million times better, the slide movement appears to be better designed although the device does appear to have lost some of its distinct curved shape (which I’ve always admired). The hardware looks like it has been addressed. Version 2 of webOS doesn’t appear to be a vast departure from version 1 and is more of an evolutionary step forwards, much like Apple’s iOS improvements and releases with every new iPhone. There are some really funky improvements though; grouping cards together is an interesting one allowing much easier and manageable multi-tasking, but the biggest change seems to be in its “Just type” feature; simply type and you’ll be given a selection of choices from ‘Synergy’ allowing you to find emails, websites, applications and the ability to post directly into those applications such as Facebook, email and even SMS messaging. 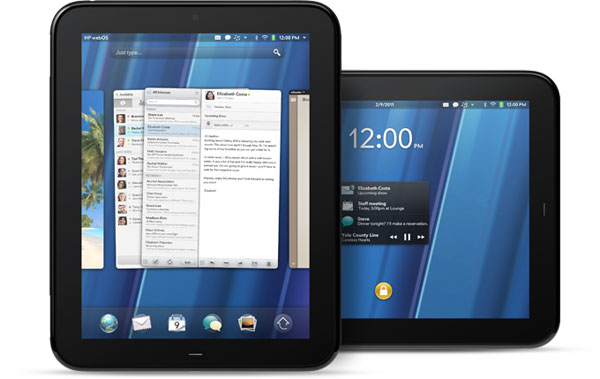 'Synergy’ has been the backbone to webOS since the beginning and it’s a well put together part of the product. Bringing localised search into the OS and making it smart is very clever indeed and with the improvements in version 2 seem to strengthen it’s involvement in the OS and provide a smart way of working and navigating through the device – this could easily be most used feature of the phone, especially if you use your device to the maximum. I’ve been scathing about the Apple iPad for some time – having never used one – but I’ve always maintained that to buy one, in my opinion, you need to buy it for a specific reason. I’ve still not managed to come up with that reason, but I am strangely tempted and for one reason only: HP’s Touchstone technology. Browse a webpage on your phone and start reading – if the time comes that you need the bigger tablet screen to carry on reading, simply touch the devices together and the webpage jumps from your phone directly onto your tablet as if by magic. I love anything like this and have secret hopes that Microsoft will develop similar technology to allow me to do similar things between my laptop and my media centre; start a film, YouTube clip or webpage on your laptop, click the “send to TV” button and it should magically appear on my TV screen. But my technology fantasy from MS aside, HP have actually gone and done it! I can see this being great for reading, especially for ebooks and with an Amazon Kindle app on the horizon, this sharing of screens between devices is going to be perfect for reading with. When using your tablet, it’s unlikely that you will be using your phone at the same time. Touch the devices to pair and create the partnership – any SMS messages that then appear on your phone are then also instantly delivered to your tablet too! was the guy who persuaded these very companies to write apps for Apple. Windows Mobile 7 is without doubt an equally attractive proposition right now, improvements are coming all of the time it seems and Microsoft will undoubtedly get developers behind the platform and grow the concept at an incredible pace if they can attract a significant user base. This, in my mind, puts it in direct competition with HP’s efforts to recruit users and developers to its platform. Secondly, if Microsoft manage to get Windows 7 onto a workable tablet, this makes any Microsoft tablet much more valuable than any tablet offerings from any other company because it already fits into my existing infrastructure (read; Microsoft Media Centre, Xbox, network attached storage, etc), and I have a bunch of applications for Windows already (read; Microsoft Office). Thirdly, Microsoft does what no other company is doing at the moment – allowing other devices to connect to each other and connect to any service of your choosing. For example, Microsoft allow you to connect to network shares, they allow you to plug your Apple iPhone, Android, HP or other phone into their operating system (admittedly sometimes using some third party connectivity suite such as iTunes or a device driver). Apple and HP’s approach with their smart phone and tablet strategy is that they expect you have both devices from one company. This locks the user into their platforms directly – I’m not a fan of this. If I wanted to buy a HP Touchpad, is HP going to provide support for me to connect a Windows Phone 7 to the device using its Touchstone technology? Whilst I can’t think of any reason they couldn’t by providing some sort of application or device driver installed onto the phone, my feelings are that this is extremely unlikely. This also probably means that a Touchpad isn’t going to support Microsoft’s cloud based services such as Live Mesh or even allow transfer of the screen from webOS to Windows 7/Media Centre/etc. This isn’t a grumble directed purely at HP webOS, it’s a problem across the board (Apple, Android, Dell, etc), with all device manufacturers right now who fail to provide that level of interoperability across platforms; only Microsoft seem to have anything close to support for multiple manufacturers. All of this closed platform, device interoperability and ‘lock-in’ to specific manufacturers in my opinion isn’t good for the next generation of technology as it shifts into cloud based services and more needs to be done by all involved to agree to some basic standards on interoperability. The problem is, no one can ever agree standards, which worries me that we’re heading towards a fragmented device/software/manufacturer reality with no open standards or interoperability. And that is a very bleak future indeed.